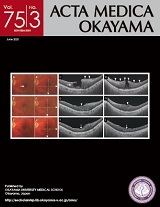 Acta Medica Okayama is published biomonthly by the Okayama University Medical School, Okayama, Japan. The journal was first published in 1928 as Arbeiten aus der Medizinischen Universitat zu Okayama. In 1952 (Volume 8) the journal was renamed Acta Medicinae Okayama and published quarterly. Biomonthly publication began in 1959 (Volume 15). The present name was adopted in 1973 (Volume 27). Instructions to contributors are on the inside page of back cover. Full text of all contents are available free with no embargo. Listed in Current Contents Life Sciences, Index Medicus, Biological Abstracts, Chemical Abstracts, Science Citation Index etc.